File the will (if any) in the local probate court. Generally, this step is required by law, even if no probate proceeding will be necessary. To learn more about this process, see Nolo's article Finding and Filing the Will. Pay debts. If there is a probate proceeding, the executor must officially notify creditors of it, following the procedure set out by state law. For help with this process, see Nolo's eForm Notice to Creditor of Death. 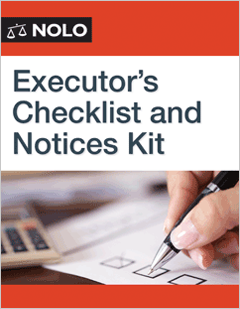 To learn about these duties in more detail, and get step-by-step advice on how to wrap up an estate, read The Executor's Guide: Settling a Loved One's Estate or Trust, by Mary Randolph (Nolo). And to see everything Nolo has to offer when it comes to estates, executors, and probate, visit our Wills, Trusts & Probate Center.